I’m a little bit ADD when it comes to painting. I loose focus real quick and before you know it, I’ve painted the whole house! So I started out the day painting my coffee table… and when that was done, I decided to paint my baseboards! Whoever refinished the wood floors before me didn’t protect the baseboards, and no amount of elbow grease would remove those yellow spots. I was sick of them! I put a layer of Shellac over the stains, turned on an audio book and had a lovely little time painting away. 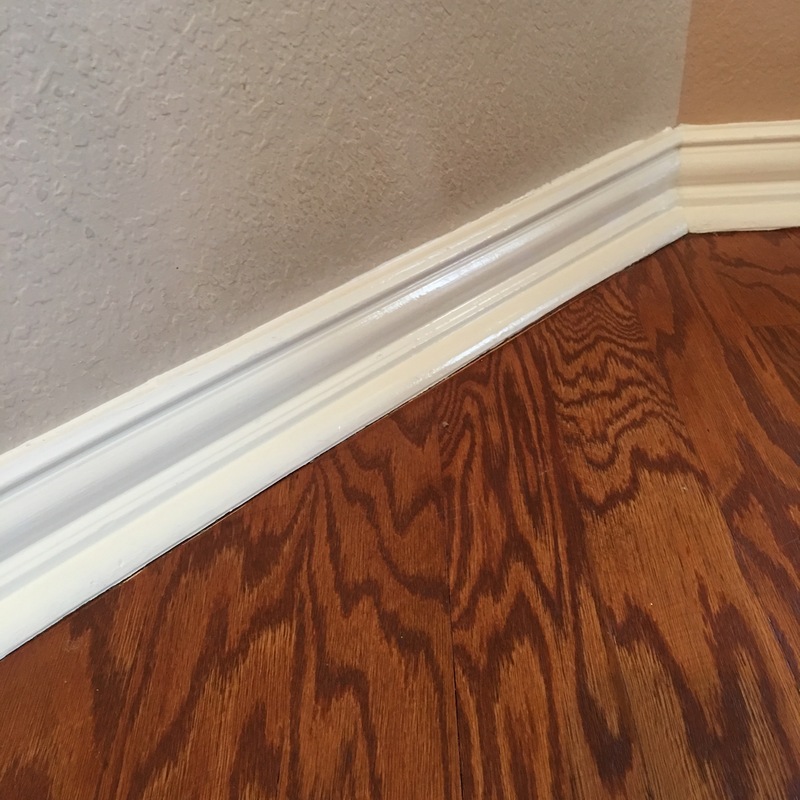 Painting the baseboards and trim is a simple trick to make an old house feel fresh! I didn’t want to paint all of the trim, so I had the old, unlabeled enamel paint color-matched at Lowe’s, and although it took a while, they got it right! Oil-based enamel paint is great on baseboards and trim because it hardens strong, covers well with just one coat, and it’s easy to wipe the dirt off. You just have to be careful because it takes about 24 hours to dry. It’s also difficult to clean up oil-based paint since water and soap won’t work. I was so thrilled with how the baseboards were looking that I moved upstairs to the hallway around the kids’ rooms. 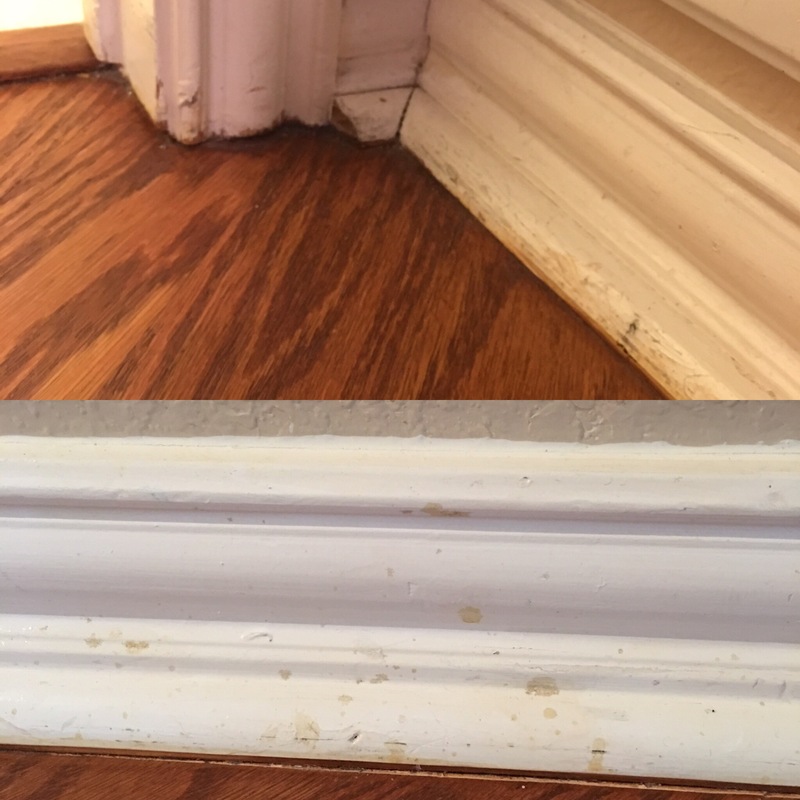 I don’t know how they do it, but the paint on the baseboards gets so dinged up in that area! I miscalculated the distance from my knee to the bottom of the paint bucket, and spilled 2 cups of paint all over the carpet. Oh my heck!! I was freaking out! I’m sorry now that I didn’t snap a picture… but I was in full crisis mode! It would be one thing if it was latex paint and I had to try and get it out with soap and water… but this was OIL-BASED ENAMEL! I was a dead girl walking. My husband was going to kill me for sure this time. I knew paint stripper had worked to get the paint out of my brushes, so I sprayed some on the spots. Paint stripper eats skin away, and since I didn’t have gloves, and still wasn’t thinking clearly, I grabbed a grocery bag and covered my hand and tried scrubbing it. Not so bright. To my horror, the paint stripper took the ink off the grocery bag and started turning the carpet blue!! Aaaaahhh! 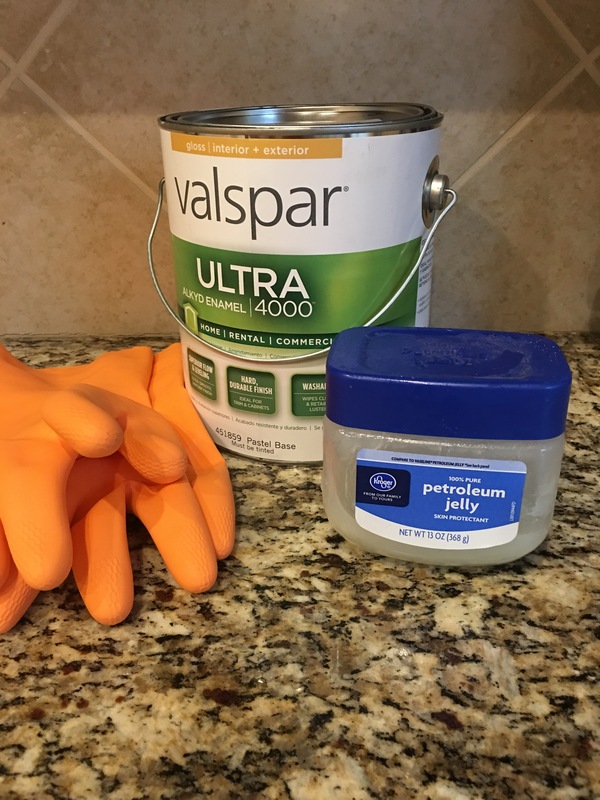 I ran to Lowes to buy gloves and ask for real know-how advice! The paint girl almost passed out when I told her what happened. But an old man who was standing there waiting for paint, asked if it was still wet. I said yes. He shook his head, and in his old southern-boy accent told me that any oil based product like vasoline or baby oil would get it out. He said not to use paint stripper because it would take the color out of the carpet. I ran back home armed with hope, thick gloves and vasoline. I smeared the vasoline into the paint, then I used a rag and paint scraper. I literally scraped and smashed the carpet so much that the paint and vasoline oozed out so I could wipe it on some disposable cloths. The vasoline worked like magic! And hot water got the vasoline out! It took about two hours of elbow grease, prayers and half a tub of vasoline, but it came out! 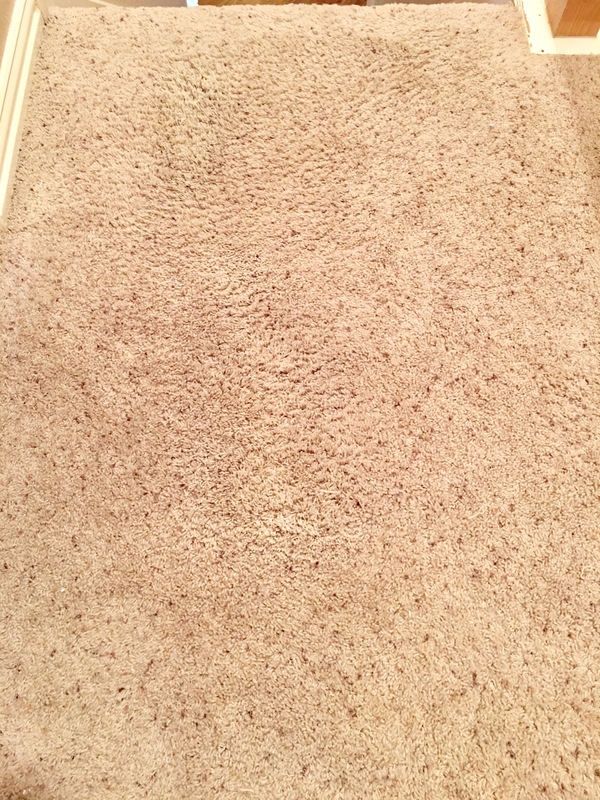 But for the most part… you’d never know 2 cups of oil-based enamel paint spilled all over this carpet! And as you can probably guess, my husband did not kill me! That man saved your life. Haha! Wow, nice job taking care of it, I would have freaked too. That is one amazing paint story! I always avoid enamel because it sounds so hard to clean up when you’re done but after hearing about your experience, it’s not so scary anymore. But I must say, I think that old man must have been your guardian angel. So glad guardian angels are around to save the day!